The Meguiar's M105 Mirror is our pick for the best car wax, which can be used with any rotary buffer for best results. It can also be used by hand, but requires some skill with handling. It can also work for any DA polisher and can help remove holograms, acid rain and scratches. Our step-up pick is the Meguiar's G18216 Ultimate and it uses ThinFilm technology to ensure that it will not stain the body of your vehicle. There is also a unique water-beading technique presented by the pure synthetic polymers of this kind of liquid formula. The budget pick is the Chemical Guys WAC_201_04 and it can give you a finish providing smooth protective coating for your automobile, which can also protect against harmful UVB and UVA rays. It is made with carnauba-based wax and is also easy to apply. A car wax is a kind of automobile shine product that gives the automobile a luster that will make it look like brand new. It is not like your average floor wax product because it is made specifically for the bodies of automobiles. It is applied through a rug or cloth that is usually made specifically for delicate surfaces, otherwise known as the microfiber cloth or microfiber towel. The automobile shine product can be an important aspect of automobile maintenance. It is commonly bought at an automobile store. You can ask your local store and you will most likely get the right product depending on your needs. The automobile shine product can come in various forms (explained below) and it may also vary depending on the type of automobile that you have. If your vehicle’s body is too rough and dull then it may need some more washing and conditioning first before you apply your automobile shine product. Some of these shine products can come in carnauba, paste or glaze forms, all of which can give your automobile a good shine. These different kinds of automobile shine products can be available in your local automobile store, however, all of them can have different results depending on your preference and the type of vehicle surface that your automobile has. For this kind of thing, do consult a local car wash guy to make sure you purchase the right one. Having a shiny automobile, despite being old, can make it feel like it is brand new. This makes it feel like the year 2000 automobile that you have has been freshly bought this year or so. Appearance is a key factor whether you are using your vehicle down the streets or whether you are selling it to someone else, and having it regularly waxed makes it feel more presentable, especially if you are a city person using your vehicle often. The amount or content of the automobile shine product can vary depending on whether you are using it for a single automobile or if you are running a carwash. If you run an automobile cleaning shop, chances are, you might want to purchase the automobile shine product in bulk, so that you will be ready with stock whenever the opportunity strikes or the rainy days come and there are many customers waiting for you ahead. However, for those with less cash, you can just go for small bottles of automobile shine products. This can make you save more if you are on a tight budget and just need to experiment on or improve the appearance of your automobile, regardless of its age and its make or model. Some people cannot really afford large ounces of automobile shine products, so they can just resort to something as small as a 16-ounce spray bottle. Many of these shine products come in easy to use spray bottles. However, some of them are sealed in regular bottles. In order to get the best results for the product, you also have to consider the ease of application. Remember that the surface of any vehicle needs to be applied with a non-abrasive formula and a cleaning surface that is not too rough like regular towels. This is why microfiber towels are used to apply it with spray bottles. Type of wax: these shine products for automobiles can come in carnauba, paste or glaze forms. The different kinds of materials for the automobile shine product can have different effects on your vehicle, usually in shine quality, as well as in ease of application. If you are not sure which is best applicable for your surface, you can ask a local car shop guy for more information about the automobile shine product. Ease of application: most of these automobile shine products can come in an easy to apply spray bottle. Having a spray bottle that you can easily use for your automobile shine product is important because you can take out the fuss in cleaning and in polishing your vehicle, so that you will have more time to do other things. A less messy application is important for people who are often on the go and have little time for their vehicle. Inclusion of freebies: some of these automobile shine product do have things like a microfiber towel for ease of application and shining. These freebies for the automobile shine product may be trivial but they can help out in case you also wanted to have a microfiber towel and you currently don’t have one. Having a microfiber application towel is important because if you don’t use a microfiber towel, you risk damaging the exterior body of your vehicle when you polish. Amount: the amount of the automobile shine product can vary depending on your needs, usually measured in ounces. Most smaller bottles can come in 16 ounces, some as small as 8 ounces, some even up to 64 ounces, but really, it depends on how much you actually need for your vehicle. For instance, large SUVs may need more content than those with smaller automobile models. Intended use: will you be using the automobile shine product for home use only? Or will you be using the automobile shine product for commercial purposes, such as in a carwash or auto detailing shop? It depends on your needs, and more amounts can save you more in the long run if you intend to use the automobile shine product for commercial purposes, so it may be best to buy in bulk this time. The Meguiar's M105 Mirror is our top pick, which can be ideally used with any rotary buffer, DA polisher or even with your hand if you like to DIY. If you want to take out sanding marks that are 1200 grit or finer, this is a good product to use for your automobile body. It uses super-micro abrasive technology to make sure that it does not damage your exterior while keeping it shiny afterwards. Each bottle contains 8 ounce of compound which can be helpful in eliminating holograms, swirls, acid rain damage and also for removing scratches, defects. It is a great product if you need deep correction for your automobile body and it is also a good choice if you have an older car that needs some love and care for the shine factor. For best results, you can use it as your 2nd to final polishing stage product. 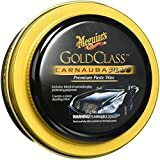 The only con with the Meguiar's M105 Mirror that is not a deal breaker is the fact that it may be best used with professional tools and can be tricky to use if you're a DIY auto detailer. 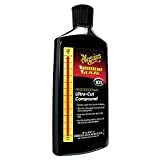 Made with cross linking synthetic polymers, the Meguiar's G18216 Ultimate is our step-up pick, which has an advanced formulation, containing 16 ounces in one bottle. With the formulation that is specifically good for water beads, the surface tension is increased due to the unique polymer (hydrophobic), which can leave a lasting shine on your automobile body. Because of the unique thin film technology, even when outdoors, it allows for effortless application and gives a deep color. You can also hope to restore reflectivity, durability and protection for your automobile body. Whatever glossy paints and clear coats you have on your vehicle, it will be a safe formulation that will definitely work for it. When you use this kind of product for your vehicle, a glossy wet look can be achieved. When use this product, you should wait for 3-5 minutes of initial cure time before you take it out. Remember, you should not apply too much. The Chemical Guys WAC_201_04 is our budget pick, which can give you protective coating for your vehicle that is very smooth. 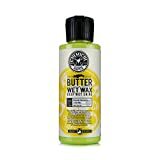 It can also provide UVA and UVB protection which can be helpful with making your automobile body protected and shiny all throughout the day or week. It is made with carnauba-based wax so it is very friendly towards your automobile body. Each bottle contains 4 fluid ounces and can also add a good appearance to any paint work. If you also want to go for chrome bumpers, painted wheels and other non-textured surfaces, this is a good product to use. You can even use it for stainless steel exhaust tips and it will definitely bring out the natural beauty of your vehicle's color. You can also use it on your boat, if you own one, since it is carnauba based as a product for adding shine to any vehicular surface. The Rain-X 5077557 Wash is a carnauba based product that is contained in a bottle with 64 ounces of shine product, which can keep your automobile body finish safe from the elements when you drive outdoors. It will be effective for a brilliant shine due to the foam material providing deep cleaning properties. It can attend well to all vehicle finishes and will be safe for them. This product is both a shine product and also a washing product. If your automobile or vehicle is often going through harsh environmental conditions, you can treat it better with the application of this product. You can use any kind of soft cotton cloth or chamois to make sure that it will not get damaged. It is also safe for your vehicle’s finish as it is made with a biodegradable and pH balanced formula. The formula can also make future grime easier to remove. The Meguiar's G7014J Gold is a paste form product that is a blend of carnauba and polymer so that you can expect that the product will leave deeper reflections and a shine like no other. It also comes with an applicator made of foam that will not damage your vehicle at all when you apply it. The product can work well on all paint types so that it can produce a brilliant reflective shine for your vehicle. Each container of the carnauba and polymer mix can create a dazzling shine at 11 ounces each. All in all, applying and removal is very easy with this product because it can last longer in most vehicles. The drying time is only about 5 to 10 minutes. It acts more of a sealer and a little goes a long way when you try to apply it for your automobile painted body and exterior glass. The Meguiar's D15601 Synthetic is a gallon container that can be used for when you want to apply the product in direct sunlight and it will not damage or melt away your vehicle’s finish. Whether your finish is wet or dry paint, it will work easily and can provide deep shine and sufficient protection. You can also use the product on the glass parts of your vehicle so that you can protect your vehicle from the elements. You can use the product if you have black plastic parts in your vehicle, as it is safe to use and will not discolor or whiten the black plastic at all. Any part of the vehicle that has plastic, rubber or glass parts can be remedied with this kind of product, in which you can simply put on your microfiber towel for ease of application for your vehicle. It has an easy on and off for all your detailing needs. Usable in both hand or machine application needs, the Chemical Guys GAP_619_6 can bring a maximum high gloss for your vehicle’s exterior due to the nano-blended synthetic formulation. It can give you a reflection that has a wet look and a sharp finish with a smooth feel. It can bring out a paint finish that is pretty slick. Each container has 64 fluid ounces so it is great for shops or need this kind of product on a regular basis. A flat lustrous surface can be achieved if you use this product for filling in swirls that are scattered throughout your automobile body. It can also protect your vehicle’s body from UVA and UVB solar rays that may harm the finish. It keeps your paint work from oxidizing, discoloring and fading over time. 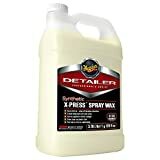 If you want your vehicle to look dripping wet, this is a great product to use keep the imperfections to a minimal. It’s great for humid areas. The Meguiar's G7716 Gold comes with 3 free microfiber cloths so that you can manage your cleaning and detailing routine much easier. It contains 16 ounces in one container and it can be easy to spray and apply to your vehicle because of the spray nozzle that is very simple and straightforward to use. It is a carnauba based product that will work on many surfaces of vehicles out there. You can expect 4-6 weeks of protection from this product. If you want to achieve a good, deep shine with very little work because you may be busy with other things other than maintaining your vehicle, this will do well and will even work even under the sun. This product may also work on most lightly soiled surfaces, like most detailing products out there. Most hazes and distortions in your vehicle finish can be removed within 2-3 applications, resulting in a surface that is very smooth. If you have less time to work on your vehicle’s finish, you can try the Griot's Garage 11148, which can work within 5 minutes for a fast acting formulation. It can work well for finishing any painted surface and making the details much better. 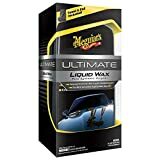 The unique blend of lubricants that are in this product can help to lift dirt off the surface, so you can end up with a cleaner looking vehicle while you are on the road. Giving your vehicle surface a glossy and smooth finish, it can be easily wiped dry in a gentle manner that will not ruin the finish or paint of your vehicle, even when it is just painted. It will also get rid of most debris like slight grime, pollen, dust, smudges and various imperfections (even bird droppings). You can use most detailing towels and can be applied to your interior plastic trims as well. The Turtle Wax T-3KT is a great kit that comes with the automobile shine product that is carnauba based. 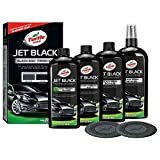 It is black infused so it is great for most jet black colored vehicles out there, to make it look dazzling and stylish. The kit also comes with other products, such as a black pre-wax cleaner and 2 black spray detailers for added beauty to your vehicle’s finish. There are 2 applicator pads that are included in this pack, so you can easily use it on the go. You can also use it either for machine application or for manual (hand) application. If you want mirror-like reflections for your vehicle’s exterior, this is a great product set to have because it will get rid of most blemishes that will make your vehicle’s body sparkling and shining like new. It will definitely work to deepen dull paint as well. Other automobile shine products did not match up with our criteria because they lacked decent instructions and also were not easy to apply. They also received mostly negative views from the buyers, and that proves that these products may not be that good for most automobiles. Q: What are the benefits of using vehicle shine product? This means that your paint or finish will not easily deteriorate due to oxidation and other similar conditions because you already have a protective finish that will keep the paint intact at all times. The fact that you have vehicle shine product on your vehicle means that cleaning it from dirt and mud will be much easier than ever before. When you don’t have any protective barrier, it will be harder to clean the surface of your vehicle. The UV rays can damage your vehicle’s paint and exterior, and this is why you should use the vehicle shine product as a protective barrier from the sun, sort of like a sunscreen, to protect the vehicle paint from easily fading under the harsh sun. Q: What are the different kinds of shine product that can be used for vehicles? The hard texture of paste shine product makes it a bit hard to apply onto most surfaces of vehicles. Natural Brazil-based shine product is used for paste shine product. Liquid shine product is the most common type of shine product because it is easy to apply. Most of these liquid shine product mixes are combined with polymers other than Brazil-based shine product. This is simply the spray form of the liquid shine product, which can usually be thinner in terms of application. They are only meant for a quick fix and not for long-term use. 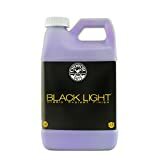 This kind of shine product is ideal for those with colored vehicles with specific paint colors. For instance, if you have a black colored SUV then your best bet is a black colored shine product. Q: Is there a difference between applying shine product and polishing your vehicle? If you want to apply shine product to your vehicle, you are doing it so that you are applying some sort of coating that is protective to keep its pain intact and away from oxidation, scratches and the like. If you want to polish your vehicle, you are doing it to get rid of bird droppings, road gunk, finish swirls and the like. Any damage that has been done to your vehicle finish can be cured by polishing. Q: How do you normally fix a streak on your vehicle finish? 1. Wash your vehicle to remove any dirt or debris. 2. Make a soapy water solution using soap and water. 3. Apply the soapy solution to your vehicle’s exterior. 4. Rinse your vehicle’s exterior to remove soapy residue. 5. Dry your vehicle using any chamois or microfiber towel. 6. Use a cleaner shine product to apply to the affected part using an applicator pad. 7. Spread the shine product using the applicator pad. 8. Repeat as needed until a uniform finish has been achieved. 9. Let the shine product dry depending on the instructions said on the shine product label. 10. After drying, wipe off the shine product from the vehicle’s surface. Q: What are the most common mistakes made by people when auto detailing? You tend to wash or detail your vehicle under direct sunlight. This can strip off the vehicle from moisture easily, and will be more prone to water sports. Swirls also most likely form if you wash or detail your vehicle when it’s still hot. Using a towel or squeegee for drying or removing dirt from your vehicle. This can cause some damage to your paint. The better option is to use chamois or microfiber cloths or towels. You tend to pour your polish or shine product directly onto the surface of your vehicle. This is wrong, because it can be too harsh for your finish or paint. Instead, use an applicator and pour whatever your formula is in that applicator first, then apply it to your surface. Your tire and rubber protecting products are solvent-based. These may not be safe for the surface integrity of your tires, as they can damage them. You tend to clean your tires and wheels as a final step. Even if the general rules of vehicle cleaning is that you go from top to bottom, cleaning the tires is actually supposed to be the first step because if you don’t clean them, they might splatter dirt and debris all over your vehicle exterior as a result of not being cleaned first. You tend to use detergents or dish soaps for cleaning. They are not ideal for vehicles because they can be too abrasive and can also potentially ruin the finish or shine product that you have applied to your vehicle. Your glass cleaner is ammonia based in its formulation. Ammonia can potentially damage your inner upholstery in your vehicle, which can be bad because it may also leave some foul odors behind. You only focus on dirty spots of your stained upholstery. You should also clean the rest of the upholstery when you do treat stains, to make sure that it is evenly cleaned. Using the same product for all your plastic parts. For your vehicle’s plastic parts, you should consider different types of cleaners or products for the different varieties of plastics. Applying shine product to your vehicle’s surface far too much. This can cause your shine product to be ineffective. Instead, just do 1 to 2 coats of shine product. Using a chamois for drying your vehicle’s surface. Chamois are great for drying before, but with the invention of microfiber, you should finish it off with microfiber instead so that swirl marks can be avoided in the future. Using a fabric softener when you clean your microfiber towels. It may sound OCD, but it can be harmful to your shine product if you leave your fabric softener on the materials of the microfiber towels. Q: How often should you apply shine product to your vehicle? Q: Why should you polish your vehicle after you shine product it? The glossy shine can help make the vehicle more attractive than ever before. If your vehicle has some dents and scratches then it can be rid of with the right polishing technique. Like applying shine product, polishing can also help prevent the effects of acid rain from ruining the finish of your vehicle. You should also polish your vehicle to avoid retention of the water spots that may happen during the cleaning or auto detailing process. Q: Which cleaning procedures are done on the exterior of the vehicle? Which are done on the interior? Q: When should you wash, shine product and detail your vehicle? Should be done as needed or when absolutely necessary, such as when you’ve gone through mud. As much as possible, every single day, if you have the time to do so. At least every 2 months, depending on the exposure of your vehicle to outdoor elements. Q: What are some important auto detailing gear that you should consider? They are needed in case you need to move from place to place when using a high pressure vehicle wash system. This can help take out the funky smell from any vehicle in question. These vehicle polishes come in liquid form and can be helpful in helping to achieve a good shine and polish for your vehicle. These sealants or shine products can be useful in order to make your auto detailing precise. They can help remove debris like dirt from the surface of your vehicle. This is a kind of machine that can be used for interior cleaning, so that you can save more time in disinfecting the interior part of your vehicle. Dressings aren’t just for salads – they’re also for the plastic parts of your vehicle, as well as for your tires and trim parts. This includes a leather cleaner and a leather conditioner, which can help improve the appearance of your vehicle’s interior parts like the seats and the like. These can help you clean the interior and sometimes the exterior of your vehicle. Shampoos that are meant for your vehicle are usually gentler because it will be applied to the surface, which can cause some chemical reaction with the paint or finish if it is not made properly. The clay bar is a staple in most high-end auto detailing shops. Their job is to take out over spraying, rust, dirt, dust and other debris from your vehicle’s surface. Glass cleaners are different from surface cleaners because glass works differently from your regular surface cleaner. If you plan on establishing your own vehicle wash, you should consider getting a vehicle wash mat to make sure that runoff water is not running off your property. Buffers are great for auto detailing because they are the ones that help you polish your vehicle’s surface to make it look shiny and smooth with great reflectivity. Vacuums are important for cleaning your vehicle’s interior, just like you would on your home interior or upholstery. They also usually have more attachments to get into very small details of your vehicle’s interior part. Q: What advantages do machine applying shine product equipment have over manual methods? 1. They make the job faster, inevitably saving time in the long run. 2. Machines do the job easier, so you don’t have to fuss over gear. 3. The pressure points and distribution will be equal at all times. 4. You will get better results with machine-done processes. Q: What are some concerns with machine polishing? 1. You should handle the machine properly to avoid holograms. 2. When mishandled, they may also produce paint damage. 3. In some cases, surface burn can also potentially happen. 4. One of the most common problems with machines include buffer trails. Q: What are the benefits of using microfiber products for your vehicle? Microfiber does not transfer the gross stuff – it keeps it away from your surface area until you clean it up. It does not give you cross contamination due to the size of its fibers. This is also the reason why it does not have cross contamination problems, so you can easily capture dirt and lock them away from your vehicle’s surface. You can also effectively save water when you use microfiber products. This is because it does not absorb too much water when you use it for cleaning. Microfiber can also help harmful chemicals stay out of place. Q: What are some misconceptions with vehicle detailing? Actually, coffee is considered to be the easiest vehicle stain to remove out there. If you do applying shine product then you might potentially damage your vehicle’s surface if you do it wrong. It looks simple, but if you don’t choose your cleaner and materials properly, and if you do it roughly, you might damage some parts of your vehicle. It is clearly not – detailing is more detailed (pun intended) than you think. It involves several steps such as buffing, applying shine product, polishing and many others. Absolutely not, because these chemicals might seep into your vehicle’s exterior and damage the finish and the paint of your vehicle. Low and medium speed are the best because buffing burns can occur if you buff too fast. Q: What are the common things that can damage your vehicle’s paint? Q: What are some ways to protect your vehicle’s paint? Q: When you apply shine product to your vehicle, how long should you leave it there before taking it off? A: Applying shine product to your vehicle involves a waiting process, known as curing or drying. In the case of applying shine product to your vehicle, you should allow at least 10 minutes in general for the waiting process. This is so that the shine product can cure and get absorbed by the vehicle itself. It may vary depending on the instructions that are written on your product’s label or packaging, as some can dry as fast as 3 to 5 minutes or so, while some with up to 20 minutes of curing required. Q: What are some of the most common ingredients found in vehicle shine product? This type of shine product is the most popular of all, and can maintain the shine of your vehicle surface. They can form a protective barrier for your vehicle’s surface. These can also protect the painted surface and can add shine. They can help seal the paint in place. They have less shine but can last longer than Brazil-based shine product so they are often combined together. This ingredient helps in evenly spreading the vehicle shine product better. Q: Why is Brazil-based shine product beneficial to your vehicle’s surface? 1. It helps add shine to your vehicle’s surface. 2. It is easy to apply so it is great for quick jobs. 3. It also makes the vehicle hydrophobic, making it easier to clean. Q: What are the pros and cons of Brazil-based shine product and polymer shine product? 1. It is a natural product. 2. The technology has been proven effective for years of use. 3. The paint on your vehicle can become lustrous and shiny. 1. It might be harder to work on. 2. Brazil-based shine product products can be a little more costly. 1. It is very easy to buff in and buff out as a shine product type product. 2. It is very cheap in comparison to Brazil-based shine product. 1. It is not naturally derived. 2. The shine is not as good as the Brazil-based shine product shine. As a whole, we think that the Meguiar's M105 Mirror is our pick for the best car wax, due to its ability to remove the damage done by holograms, acid rain and scratches. It can also work well for any DA polisher or rotary buffer.